Nicholson De Vos is one of the most efficient and cost-effective portfolio management practices in the country; its decentralised structure – with attorneys and staff in locations across the United States, as well as a core team situated in a physical office in Silicon Valley – enables it to be incredibly flexible. In addition to its prosecution duties, the firm has been engaging in some complex post-grant activity and undertaking offensive analyses for large international clients. Daniel De Vos garners great reviews from foreign associates: “He is a pleasure to deal with and is brilliant on matters concerning complex technology and cutting-edge legal issues. He has outstanding communication skills.” Fellow founding partner David Nicholson focuses on building commercial value in everything he does for clients. Both partners provide gold-standard guidance to start-ups and mature companies in the IT space. 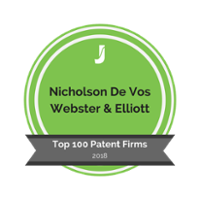 It has also included Dan De Vos and David Nicholson on its list of recommended patent prosecution attorneys. The IAM Patent 1000 features 46 country-specific chapters analysing local patent professional services markets and detailing the firms and individuals identified as leaders in their respective fields. The tables and accompanying detailed editorial reflect the depth of expertise, market presence and levels of work on which firms are typically instructed. The publication therefore serves as a one-stop reference source for anyone seeking patent services.